Follow us on Instagram for our 2018 campaign! The Balloon-borne Imaging Telescope (aka. SuperBIT) is a wide-field (0.4 deg) instrument operating in the visible-to-near-UV bands (300-900 um) at a diffraction-limited resolution of 0.25 arc seconds. This requires 20 milliarcsecond image stability over a 0.5 degree field-of-view for integration periods ranging from 10-30 minutes. 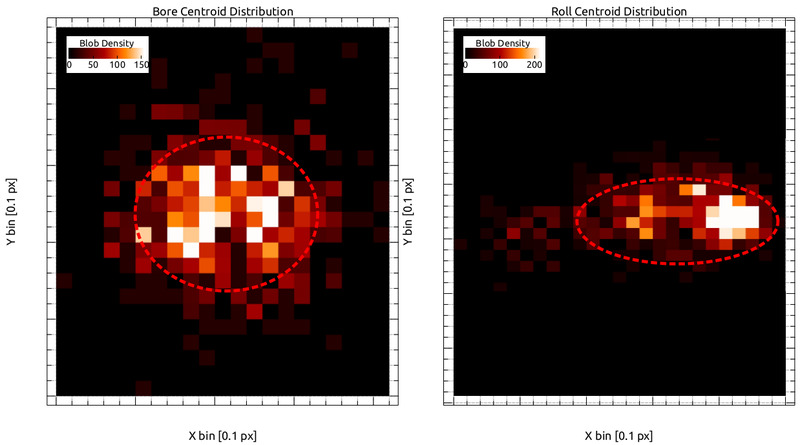 When fully operational, SuperBIT will be capable of wide field diffraction-limited observations which will use strong and weak lensing to map out the distribution of dark matter around hundreds of galaxy clusters. Additionally, SuperBIT is well suited for other proposed experiments related to solar planet spectroscopy and exoplanet studies. International collaborators for SuperBIT include the University of Toronto Physics and Astronomy Departments, the Dunlap Institute, and the Institute for Aerospace Studies (UTIAS), the Durham University Centre for Advanced Instrumentation (CfAI), Princeton University, and the Jet Propulsion Laboratory (JPL-NASA). Our multidisciplinary team includes astronomy, astrophysics, and engineering graduate students as well as leading experts in cosmology, experimental physics, and balloon-borne instrumentation. SuperBIT's inaugural engineering flight took place during the September 2015 Campaign from the Timmins Stratospheric Balloon Base with the Canadian Space Agency (CSA) and Centre national d'etudes spatiales (CNES), with a second engineering flight in 2016 from NASA's Columbia Scientific Balloon Facility in Palestine, Texas. Upcoming flights include a third engineering flight from Palestine in 2018, in preparation for a three-month ultra-long-duration balloon flight (ULDB) in 2020 from New Zealand, which will demonstrate the capabilities of SuperBIT as a facility class instrument. From the 7-8 hour flight, sub-arcsecond pointing stability of the telescope was again demonstrated and reconfirmed from the Timmins 2015 flight, with an average rms pointing stability of 0.6". As an improvement to the Timmins 2015 performance, target acquisition accuracy was within less than 0.1 arcminutes for the targets selected. Similar to the Timmins 2015 flight, a combination of frameless motors, a large reaction wheel, and a speed-controlled pivot motor provided the gimbal-based actuation necessary to acquire targets and stabilize the telescope using high bandwidth rate gyroscopes and a pair of custom star cameras for attitude feedback. Furthermore, improved image stability was achieved using the fine guidance system comprised of a piezoelectric tip-tilt actuator as well as feedback from a focal plane tracking camera and rate gyroscopes. The resulting image stability was <0.1" over 10-20 minutes, during which science images were captured. 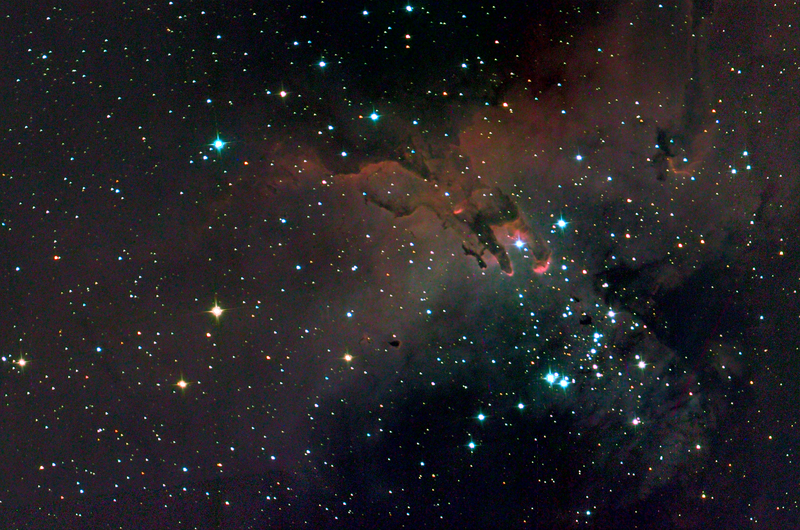 Several images of the Eagle Nebula were taken over 1-5 minute exposures in the near-infrared, red, green, blue, and ultra-violet bands as well as in broadband, which were later combined into a single composite colour image. For more details, visit the 2016 Campaign news article. From the 8 hour flight, sub-arcsecond pointing stabilization of the telescope frame was demonstrated over tracking periods of more than an hour at a time. During a given tracking period, the telescope was stabilized to approximately 0.6" rms using a combination of high precision rate gyroscopes and custom-built star trackers as inertial sensors as well as frameless motors and a large reaction wheel for gondola control. The image to the top right shows the centroid locations of the guide stars in the two star trackers over a period of several minutes while stabilizing the gondola. 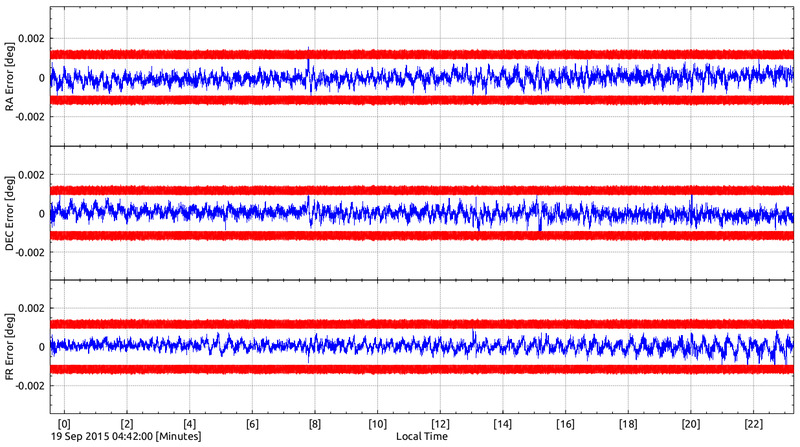 the image on the bottom right shows the attitude estimation and control consistency and stability over a 25 minute period. On the focal plane, back-end optics, which consisted of a guide camera and a piezoelectric tip-tilt actuator, further stabilized the image to 0.15" over several minutes. A plot of the centroid distribution on the guide camera over several minutes is given below. The performance of the image stability at this stage will be improved for future flights with a higher bandwidth piezoelectric controller as well as further calibration of the telescope optics. For more details, visit the 2015 Campaign news article.